KToon has its own native file format with a .ktn suffix for saving projects, but this is unlikely to be understood by any other program. 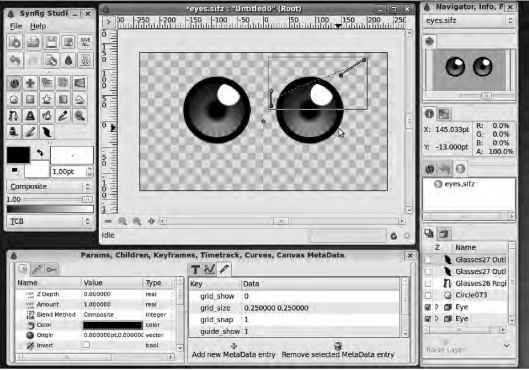 You have the option to export individual frames as a series of numbered PNG or JPEG images; this approach is compatible with a wide range of graphics programs, but given the number of frames required in any animation of significant length, it isn't the most convenient format for playback. In order to put your animation in front of an audience, you need to save it in a standard format that is compatible with media player software. Just as with SVG, which you read about in the last chapter on vector graphics, a format designed for this purpose has been standardized by the World Wide Web Consortium (W3C). It's called Synchronized Multimedia Integration Language (SMIL). In the implementation used by KToon, the .smil format comprises a directory full of PNG images and an XML file that describes the order in which the images should be played back. SMIL is supported in several up-to-date media players and should soon be supported directly in web browsers. To make the export, first click the icon button for the Export dialog in the lower-left corner of the KToon main window. If the KToon package you're using has been compiled with video support, you see options to export directly to a video file. If you're using the Ubuntu package, though, you only see options for Image Arrays (a bunch of stills) and SMIL 2.0 in the list (see Figure 5-9). Select the export of all scenes, specify a file name, and click the Export button. Figure 5-9. Ktoon's Export dialog (in Ubuntu) offers a choice of a sequence of PNG or JPEG stills, or a SMIL file and data directory. ■ Note If you decide to export in SMIL format, be careful about where KToon puts the still images referenced by the .smil file. By default, it saves the stills in a directory called data, with each still having the prefix of the project name and a suffix of the frame number: for example, ktoon-project0004.png. Therefore, when you copy or move a KToon project, it's essential that the correct data directory is copied together with the corresponding .smil file. If you had several KToon projects, all with their stills in directories called data, there would be plenty of room for confusion. How to save pictures from ktoon?